This tomato tart recipe might also be called a quiche. It came from a now out of print Williams Sonoma Entertaining Cookbook – where it is deemed a tart. I’ve made a few adjustments to the recipe – the largest of which is that it takes at least twice as long to cook as the original instructions say. I first made this quiche for a back yard brunch and play for some neighbors and their children. It was very well received. Kathleen has since asked me several times for the recipe. It only took me 2 years ; ) but I finally remembered which book contained the recipe. I’ve made this with half and half and I’ve made it with cream. It works both ways, but the cream is way better. Anything resembling a quiche exists as the antithesis of diet food. This tastes delicious and while you definitely shouldn’t eat it every day, pull it out every now and again and savor the taste. It delivers a wonderful spicy, savory flavor that is surprising, then delightful. Also can be made using a store bought frozen pie crust for ease! Can be served for brunch, appetizers, or as a side dish at dinner. In a food processor, combine flour and salt. Add butter and shortening cut into little pieces. Use the pulse button to cut butter and shortening into flour until you see no more large pieces. Through the top, pour the water 1 tablespoon at a time and continue to pulse until dough is just moist. Move to a floured surface and form a ball. Roll out with a floured rolling pin into a circle. Press into the bottom of a glass pie pan, evening out and smoothing the edge. Freeze overnight. Core and cut tomatoes into slices. Using a paring knife, trim the seeds and jelly from the slices, then move to a colander to drain. Salt tomatoes slices, then let sit for 30 minutes. Preheat oven to 350. Remove the now frozen pie crust, and use a spatula to cover the bottom with the Dijon. Sprinkle with mint, then top with the Gruyere slices. Arrange tomatoes on top of the Gruyere. Combine cream and eggs, whisk to beat. Season cream and egg mixture with the salt and pepper, then pour over the tomatoes. Bake in oven for about an hour, until filling has risen and firmed and has a golden brown color. This looks divine! 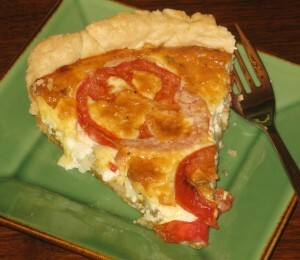 I love tomatoes and eggs and pastry…I will be making this soon!